Houston, TX, USA, Dec. 05, 2016 – Principle Information Technology, the leading platform for solutions and services that span the range of Cloud, IoT, BPM, ERP (SAP, Oracle etc. ), Project Management and mobility, announced that it has awarded compliance to ISO 9001:2015, ISO/IEC 27001:2013 and ISO 20000:2011 certification for quality management system (QMS), information security management system (ISMS) and IT service management system (ITSMS) with the help of Global Manager Group’s consultancy services. The certifications are granted by ISOQAR – UKAS, UK based widely recognized and prestigious certifying body after successfully audited the implemented all 3 systems with hard work of more than 4 months of system establishment by Principle Information Technology company. This is the big achievement for the company to get all the 3 certificated from globally reputed company ISOQAR by implementing integrated systems for QMS, ISMS and ITSMS. Global Manager Group has completed ISO 9001, ISO 27001 and ISO 20000 certification consultancy projects within time limits by implementing effective QMS, ISMS and ITSMS within Principle InfoTech process areas at Houston, United States. ISO 9001 helps organization to achieve quality requirements in all departments, which results in continuous improvements. ISO 27001 helps organizations manage the security of information assets, including financial and third-party information, and helps ensure that risk, governance, and compliance practices meet the most rigid standards. ISO 20000 helps organization to control for providing software support services related to ERP which includes SAP, ORACLE, BPM-tools, HANA & Luxon etc., to their clients. ISO QAR, UKAS accredited certifying body has awarded Principle Information Technology Company the certification after completion of a rigorous third-party audit of its QMS, ISMS, ITSMS and related business processes. Principle InfoTech’s ISO 9001 audit, ISO 27001 audit and ISO 20000 final audit follows successful recommendation and completion of Global Manager Group’s ISO Consultancy project at USA. During this highly technical consultancy project, Global Manager Group has helped Principle InfoTech to understand requirements via online ISO training programs on ISO 9001, ISO 27001 and ISO 20000 system awareness, gap analysis, work management, ISO documentation preparation, auditor trainings, internal audit as well as final assessment audit, done by UKAS accredited certifying body auditors from 3rd to 8th November 2016. The ISO/IEC 20000 is given by ISOQAR certifying body with accreditation of reputed company APMG international. Global Manager Group helps Software solution provide company to aware of the requirements of quality management system as well as need to maintain the highest standard for securing the data of customers as well as service management systems. With this achievement of ISO 9001, ISO 27001, ISO 20000 certifications – Principle InfoTech has assured that customers have confidence in their commitment to quality process as well as secure and protect their data and that of their suppliers. Global Manager Group achieves a new project under its Online Consultancy services to upgrade documentation for EQMS certification of leading IT Company in Abu Dhabi. The IT organization that certified to ISO 9001:2008 and ISO 14001:2004 was looking to upgrade their documents and having a requirements of upgrading documentation that accomplish ISO 9001:2015 and ISO 14001:2015 requirements to upgrade their existing certificate to 2015 version of ISO 9001 and ISO 14001. 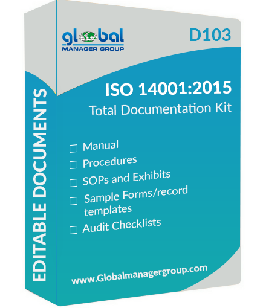 As company is seeking for Online ISO Consultancy, which saves their time and cost, they outsourced to Global Manager Group, which is leading name in readymade documentation provider for more than thirty international system certification. Globally all tech certified companies are taking services of Global manager group to modify their existing ISO 9001-2008 and ISO 14001-2004 documents to ISO 9001-2015 and ISO 14001-2015 requirements. In this distance ISO consulting project, Global Manager Group has provided all help for establishing and development of quality management system and environmental management system in terms of system up gradation documents requirements. 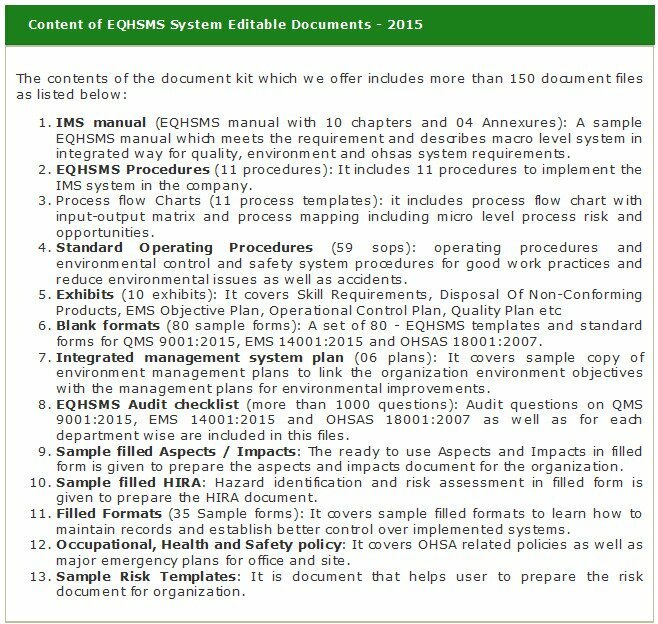 There are following list of documentation for ISO 9001:2015 and ISO 14001:2015 are prepared by GMG’s EQMS consulting team. Above all ISO 9001 14001 documentation were prepared for all the departments of an IT organization, which reduce cost and manpower required in this project. The company has already implemented the quality management system and environmental management system as per previous standards, but the revised ISO documents helped them to understand the requirements of new ISO 9001 and ISO 14001 standards as well as to accelerate the certification up-gradation process. Global Manager Group’s strategy by such online projects was to present online consultancy for ISO documentation as world’s leading Knowledge Processing Outsourcing – KPO for ISO certification, which can be exciting place to work where there are many opportunities to grow. This statement was purposely used to create curiosity so the client would continue fulfil their requirements with accurate and effective documentation with time and cost saving services. Global Manager Group has already sold out more than 50 copies of Ready-to-use EQMS Documentation Kit, which is a set of sample integrated QMS EMS documents for quick certification, available at www.Globalmanagergroup.com. To establishing the common effluent treatment plant under the name “The Green Environment Services Co. Op. Society Limited” is developed under Vatva industries association and Gujarat dyestuff manufacturer’s association, Global Manager Group has taken consultancy to implement integrated management system, and successfully achieved ISO 9001:2015, ISO 14001:2015, OHSAS 18001:2007 certification from ISOQAR – UK based certifying body. The process designing is carried out by M/s. Advent Corporation, USA one of the internationally renowned consultants for the industrial wastewater treatment. The commissioning and operations supervision is done by advent’s Indian collaborators Advent Envirocare Technology Pvt. Ltd., Ahmedabad. Detailed engineering for the CETP project is carried out by renowned consultant M/s Sudarshan Chemicals Industries Limited, Pune (India). Global Manager Group has implemented ISO 9001:2015, ISO 14001:2015 and OHSAS 18001:2007 systems in the Organization by training employees of all level. The effective implementation of EQHSMS management system, training, documentation and certification is completed in given timeframe by Global Manager Group. During the implementation of ISO 9001:2015, ISO 14001:2015 and OHSAS 18001:2007 followings steps were implemented. Environmental aspects and impacts, Hazard identification and risks assessment and determining controls, is consultation with the company employees down the level. Preparation of quality and EHS objectives and its targets and informing the employees for routine tracking, control and monitoring of the same. The Vatva Industrial estate has been developed by Gujarat Industries Development Corporation in the year 1960 accommodates small and medium scale Industries. This estate is located in south east direction of Ahmedabad – Mehmadabad state highway. Company is having Common Effluent Treatment Plant and Multi Effect evaporation facility for treatment of the waste water collected from the member industries. In this industrial estate there are approximately 1600 units, out of this approx 600 industries generated effluent. These unit include pharmaceutical products manufacturers, rolling mills, process houses, dyes and dye intermediates manufacturers, pigment manufacturers etc. To treat the effluent by individual member units at source was very difficult and techno-economically not viable hence to solve this problem, the most practical and cost-effective approach was adopted by establishing the common effluent treatment plant under the name “The Green Environment Services Co. Op. Society Limited” with the support of Vatva industries association and Gujarat dyestuff manufacturer’s association.